Description: A westbound BNSF train passes by the wig-wag at Camden. Description: Just caught this one. Movin' fast! Description: I had just driven off the small ferry that crosses this Mississippi here, when this one snuck up on me at track speed. Wow! Title: Sweet Morning Light On BNSF Powered 214 @ 0736 hrs. Description: Power that was on the H BARPAS2 the night before, now heads across the Columbia for the Yakima Valley and Stampede Subs. Description: Thanks for the comment! Description: Eastbound at CP Yost , only one seen that nite due to flooding out west. Description: 16-car OCS they sent up to Omaha for the Berkshire Hathaway annual meeting. Description: Officer's Special northbound into Larkspur on Main 2. Description: BNSF Officers Special from Laurel, Montana to Seattle King Street making it's way into Missoula for a quick stop. Description: BNSF Officers Special from Laurel, Montana to Seattle King Street, seen leaving Missoula headed up the 10th sub. 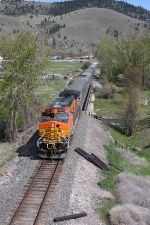 Description: BNSF Officers Special from Laurel, Montana to Seattle King Street, headed into Arlee. Description: BNSF Officers Special from Laurel, Montana to Seattle King Street just west of Ravalli. Description: BNSF Officers Special from Laurel, Montana to Seattle King Street, west of Dixon. Description: BNSF Officers Special from Laurel, Montana to Seattle King Street between Dixon and Paradise.